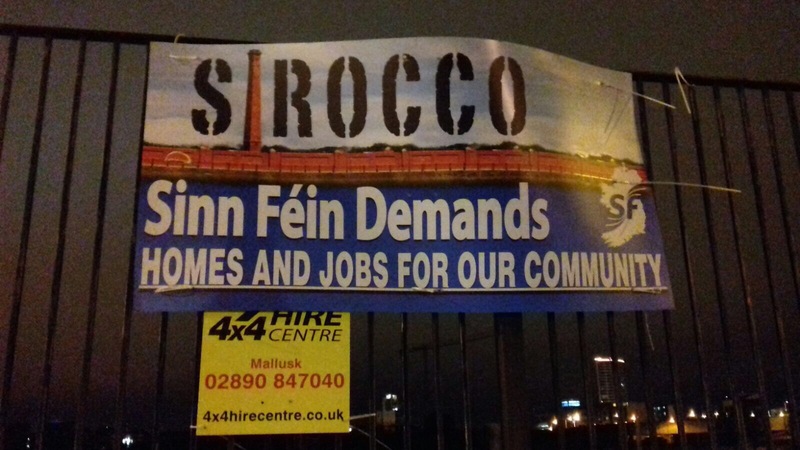 Sinn Fein has controversially sought to create a nationalist ghetto at the Sirocco site with a sectarian campaign to ‘demand’ housing. The Sinn Fein ‘demand’ is politically motivated, designed to create another nationalist ghetto and interface in the east Belfast area. The overall strategy of the sectarian Sinn Fein demand for nationalist only housing is to be able to gain electoral advantage by having another nationalist stronghold in the east Belfast area, and also to create another parading flashpoint. The sectarian banners were erected in recent days and have come about following collaboration between Sinn Fein and dissidents in the area who are both determined to stamp their authority on the potential new development in order to ‘Keep Protestants out’. 89 Responses to "NEWS: Sinn Fein demands sectarian ghetto at Sirocco site in East Belfast "
You could definitely see your skills within the paintings you write. The world hopes for even more passionate writers like you who aren’t afraid to say how they believe. Always go after your heart. Hello.This article was extremely fascinating, particularly because I was browsing for thoughts on this topic last week. I’m still learning from you, while I’m trying to achieve my goals. I definitely love reading everything that is posted on your blog.Keep the aarticles coming. I liked it! I do accept as true with all of the ideas you’ve presented for your post. They are really convincing and will certainly work. Still, the posts are very brief for starters. May just you please extend them a little from next time? Thanks for the post. Thanks , I have just been looking for information about this topic for a while and yours is the greatest I’ve came upon till now. But, what in regards to the conclusion? Are you sure about the supply? I precisely had to say thanks all over again. I’m not certain the things I might have used without those tips revealed by you concerning that area of interest. It actually was an absolute troublesome matter for me, however , viewing the well-written mode you treated it forced me to cry for joy. Now i’m thankful for your information and even sincerely hope you recognize what a great job your are getting into teaching many others using a blog. Most likely you have never met any of us. I simply wanted to thank you so much once more. I am not sure what I could possibly have made to happen without the entire basics revealed by you concerning my problem. It truly was a very frightful issue in my position, nevertheless noticing a new specialised fashion you treated the issue made me to jump over gladness. I am just happier for your advice and then hope that you really know what a powerful job you are always putting in training the rest through the use of a site. Most probably you have never encountered any of us. What’s Taking place i’m new to this, I stumbled upon this I’ve found It absolutely useful and it has helped me out loads. I am hoping to give a contribution & assist different users like its aided me. Good job. F*ckin’ remarkable issues here. I am very happy to peer your post. Thanks a lot and i’m taking a look ahead to contact you. Will you please drop me a mail? Thanks , I have just been looking for info about this topic for a long time and yours is the greatest I’ve came upon so far. But, what concerning the bottom line? Are you sure in regards to the source? wonderful points altogether, you simply won a brand new reader. What may you recommend about your post that you made a few days in the past? Any certain? Thanks for your personal marvelous posting! I truly enjoyed reading it, you might be a great author.I will be sure to bookmark your blog and will often come back in the future. I want to encourage you to ultimately continue your great work, have a nice morning! Attractive portion of content. I simply stumbled upon your site and in accession capital to assert that I acquire actually loved account your weblog posts. Anyway I will be subscribing in your feeds and even I achievement you get entry to consistently fast. After research a few of the weblog posts in your web site now, and I really like your approach of blogging. I bookmarked it to my bookmark web site record and might be checking again soon. Pls check out my website online as effectively and let me know what you think. Its such as you read my mind! You appear to grasp a lot approximately this, such as you wrote the e-book in it or something. I feel that you simply can do with a few to pressure the message house a bit, however other than that, this is fantastic blog. A fantastic read. I’ll definitely be back. hey there and thank you to your information – I have definitely picked up something new from right here. I did then again experience some technical issues the usage of this site, since I skilled to reload the web site a lot of occasions previous to I may get it to load correctly. I had been considering if your hosting is OK? No longer that I am complaining, but slow loading circumstances occasions will very frequently impact your placement in google and could damage your quality rating if advertising and ***********|advertising|advertising|advertising and *********** with Adwords. Anyway I’m adding this RSS to my email and could look out for a lot extra of your respective interesting content. Ensure that you replace this once more very soon.. Thanks for your marvelous posting! I genuinely enjoyed reading it, you may be a great author.I will be sure to bookmark your blog and will eventually come back later in life. I want to encourage you to continue your great work, have a nice evening! I know I am getting know-how all the time by reading such fastidious articles or reviews.